Enjoy your entertainment with a fast 1.3 GHz quad-core processor. Fire HD 8 offers more RAM and faster performance than Fire 7 to deliver the ultimate tablet experience. Fire HD 8 features a 1280 x 800 high-definition display with over a million pixels (189 ppi) and a bright, vivid picture. Enjoy movies and games in a crisp, clear HD resolution, with reduced glare and increased brightness thanks to a stunning IPS (in-plane switching) LCD display. With 2x more internal storage than Fire 7, Fire HD 8 comes standard with 16 GB. Expand your tablet's storage by up to 256 GB using a microSD card and keep photos, movies and compatible games and apps with you. Plus, enjoy free unlimited cloud storage for all your Amazon content and photos taken with your Fire tablet. 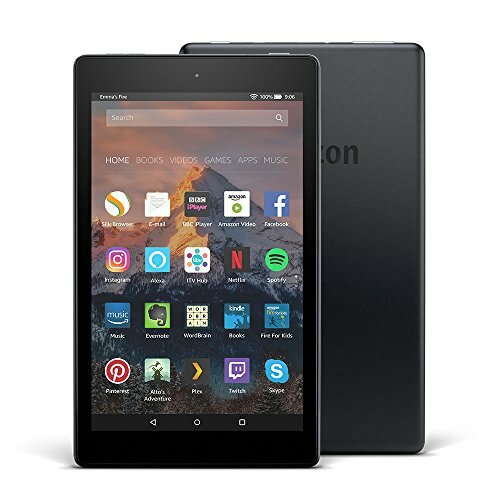 Fire HD 8 features a 2 MP rear-facing camera for taking photos or shooting 720p HD video. The front-facing VGA camera is perfect for Skype calls with friends and family.